This is one of 3 mini session dates for this Fall. Full sessions are also very limited this year, so please do not wait to book! 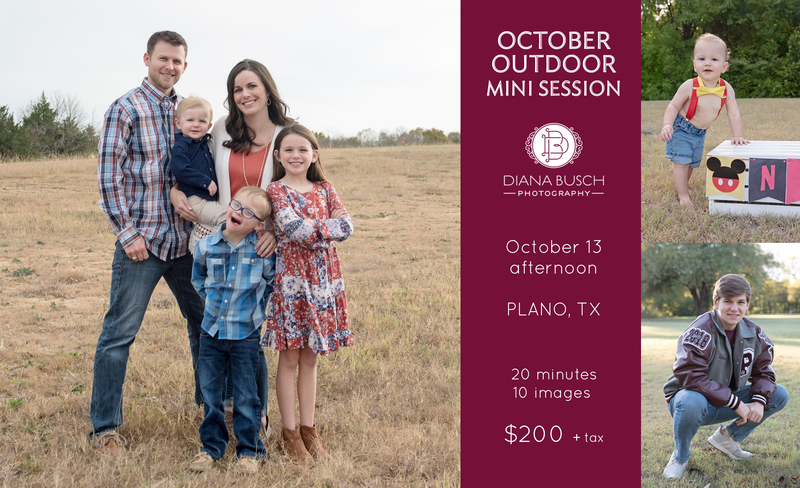 This Mini Session will be in the afternoon in Plano. The available times are listed below. You must pay the $100 booking deposit to secure your session. 4:30 p.m. 4:50 p.m. 5:10 p.m. 5:30 p.m. 5:50 p.m. 6:10 p.m.
As also, referring friends earns you credits towards sessions and prints! So make sure that they mention your name!